2. Difficult to clean if paint gets inside. 3. Only sits on right side of gun, bad for left handed players. The Tippmann Cyclone feed system is one of the best paintball loading devices every manufactured. This system is so easy to install for the new to paintball to the experienced players. The Tippmann Cyclone system is a feeding system that only fits the Tippmann brand paintball guns. This system actually uses the air off of the paintball gun in place of using batteries to power the loader to spin. Each time the player pulls the trigger on the paintball gun the air burst that goes through the gun is also sent through a small tube that is attached to the cyclone feed system. This air is used to force the loader to spin one time per shot allowing it to keep up with nearly any rate of fire your paintball gun can cycle at. With the loader only being used on Tippmann paintball guns it has been perfectly design to pretty much work at all times, in all conditions with most of the more popular Tippmann Paintball Guns. The Cyclone feed system only mounts to the right of the guns causing left handed players to now have a huge loader in their way when holding their guns. One of the best features of the loader is that because it does set off to the side, players can now see directly over the top of their paintball guns which allows them to add red dot sites or scopes onto the railing on the top of their guns. The loader that comes with the cyclone system is easily attached by a click in method that anyone can figure out and easily use. The low profile hopper works great and there are other aftermarket hoppers that will attach to the cyclone feed system as well. 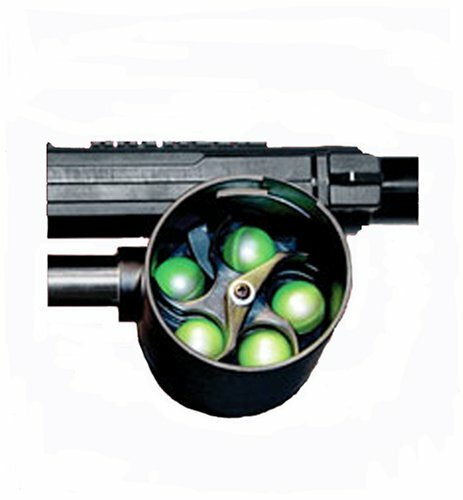 The stock hopper that comes with the cyclone system holds 200 paintballs and can have any halo or universal speed feeds attached to it as an upgrade. The cyclone system also has a feature in case of a ball jam the player can manually force the feed system to spin. In the case of a ball jam or you are running low on air and the cyclone system isn’t feeding correctly, you can manually feed paintballs into your gun to still finish out the game strong! This system is for the Alpha Black, Alpha Black Elite, Project Salvo, and the Tippmann 98 Line of markers.